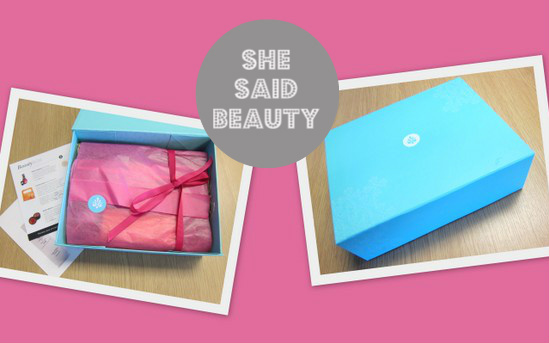 She Said Beauty: The Hottest New Beauty Box in Town - Plus A Bit of News from Fluff and Fripperies! By now, we're all familiar with the beauty box concept - essentially, beauty subscription services where you sign up to receive a surprise delivery of sample makeup and skincare products each month. New to the market is She Said Beauty, which has just announced an extension of its service to Ireland. I was really impressed with the box I was sent, with three full sized makeup products - a hot pink Filthy Gorgeous nail polish, tinted lip balm by Mischa Barton and a pretty champagne shimmer powder from BellaPierre - along with a small tub of Face and Neck polisher from Bharti Vyas and two sets of sample sachets from Comfort Zone and Erno Laszlo. Oh, and a Lindt chocolate egg, too! But with Feel Unique failing and Carmine being acquired by Glossybox, this is clearly a competitive market. So what sets She Said Beauty apart? Well firstly, there's the Online Community. Set up a free account and in 60 seconds you can create your personal beauty profile, including a unique url - you can check mine out here - to review products, comment, interact with other members and more. There's also the Online Beauty Magazine, with daily articles from a range of contributors, from bloggers to industry heavyweights like the Beauty Director of Elle UK, Emma Strenner. And here's my news: I'll also be writing regularly for the Beauty Magazine ( as well as daily here on Fluff and Fripperies and weekly on Beaut.ie)! You can check out my first piece, on the beauty of Irish seaweed products, here - I'd love to know what you think, and to hear your suggestions for the future. She Said Beauty costs £9 (plus £2.95 p+p) - the Irish rate will be whatever the exchange rate is at that time. If you're interested in checking it out you can sign up here - and to get 25% off the price of your first box, just enter SSB25OFF at the checkout. So, are you already a beauty box subscriber? Like the idea of this one? Share your thoughts in the comments! 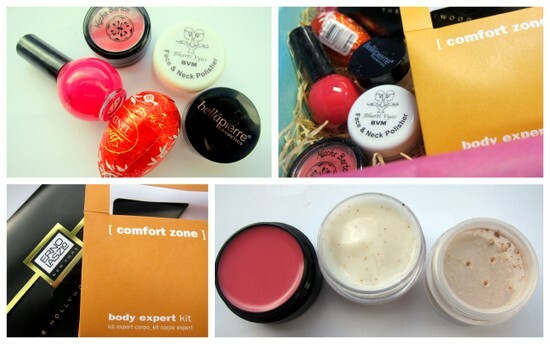 I don't subscribe to beauty boxes as friends of mine have said they can be a bit hit & miss. I'm always drawn in by the gorgeous packaging!! Super thrilled for you Em, as Sarah says it's more than well deserved. Emma that is so cool! Such great news for you- Congratulations! I'll be a regular reader! No, I didn't know about beauty box subscriptions. Why did I not know about this? "smacks head - doh"
Thanks for the info and best of luck with additional slot - not that you'll need it. Next stop, Image or some such glossy print mag. Whoop Whoop - congrats my dear - can't wait to read your updates !! Congrats Missus, delighted for you! I am not surprised I think Fluff and Fripperies is one of the best Irish beauty blogs out there and you are one of the best Irish beauty bloggers!!!! Look forward to reading more Emma! Cheers Emma - and likewise, will be interested to hear how you get on with Glossybox! I've always been interested in a beauty box subscription, and this one looks like the best I've seen so far! Aww congrats on writing for that magazine doll. Sounds amazing! Wish I could suscribe but I'm skint. Congrats to you! I just read your email and loved the review and look of the box so have placed an order.Ooops! Had been reading about She Said Beauty recently so worth a shot, especially with a discount code. Can't wait to get it!! Wow, never knew this existed. So hard to keep up with all the new goodies! nice! Oh my gosh congratulations! What wonderful news!! Funnily enough, the only two beauty box services I signed up to were the aforementioned Feel Unique and Carmine boxes. I'm not sure how I managed to choose BOTH boxes that folded... I might consider this one though. It sounds like you had a great haul! I haven't signed up for any beauty subscription services, but they sound pretty cool! Its great to see another beauty box hitting the Irish shores, this box definitely has nice look about it. Congrats on the new gig aswel! I haven't subscribed to any beauty boxes but this one seems much more affordable! Congrats lovely! I'm already loving your posts here and on Beaut.ie, looking forward to reading these new ones too!